Secondly, it means we've got a new position of the month at Artemis BJJ, which will be closed guard. I'm kicking off the month with a discussion of closed guard grips. A basic but very useful grip is to get a really deep grasp of the collar: you may find it helps to sit up to get that in really deep. As Roy Dean discusses in Brown Belt Requirements, an especially deep grip can help your choke as well as give you authoritative control. Once you have it, that provides three main advantages. Firstly, this gives you great control, as you can pull them down towards you. Second, it could be the beginning of a choke, and perhaps more importantly, it will make them start to worry about that choke rather than thinking about passing. Thirdly, it means you can establish a collar and elbow grip. 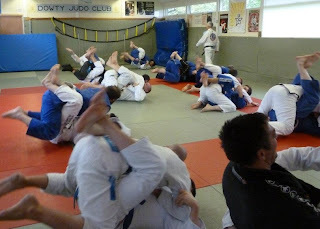 There are various attacks you can do from there, the most common of which are probably armbars, scissor and push sweeps. I then suggested double wrist control (emphasising to keep your elbows close to your sides for added leverage), which meant I could emphasise the two main types of sleeve grips: either make a pocket with your thumb and insert your four fingers (rather than putting four fingers inside the sleeve or trouser cuff: that's not only competition illegal, it's dangerous), or get a pistol grip, where you grab a heap of cloth in your fist. Another grip is to grab their trousers by their knee, the other hand on their sleeve. This again can be useful for sweeps. It also helps to stop them getting a knee into your tailbone, as you can use that grip on the knee to bounce your hips back over their knee. It might also make them nervous, as they'll assume you're setting something up, whether or not you actually are. That’s when they’re liable to make mistakes which you can then exploit to your advantage. The most basic method of breaking posture is probably pulling their elbows out and then towards you. This is particularly handy if they've got both hands on your hips, or something like that. Using your legs is key here, to help you pull them forwards. This is a general point for the guard: make sure you involve your legs, as they're a lot more powerful than your arms alone. This is also true if they want to stand. Carefully time the right moment, then as they start to lift up, pull your knees towards your chest. That should knock them back onto the ground. It could also put you in a better position than before, as they may end up falling into you, meaning you can get superior control. Ideally, they'll make the mistake of posting on their hands, as that means you can go for various attacks, like the kimura. If you want to maintain closed guard, then you need to stop them setting up their pass. If they try to pass from the knees, the first thing they normally do is put a knee into your tailbone, or somewhere else on your bottom. The easy way to scupper that is to grab onto the gi material by their knee and shift your hips back over to the middle. That can be very frustrating for the person trying to pass, which is good for distracting them and working an opening to attack. On the downside, it can consume a fair bit of energy, as you might find yourself doing it repeatedly if they're really persistent. Another option is a very simple sweep from Henry Akins, where you just pop your hips over to the opposite side and knock them over. Teaching Notes: I didn't run through everything in my notes, as I'm still not sure the lesson flows very well. I focused on the collar and elbow grip as well as pulling them in with your legs. It feels like it is useful, but I'm wondering if perhaps I should be thinking about a grip that doesn't involve the collar too. For example, underhooks and overhooks, various nogi options. That gable grip on the shoulder could be useful too. After all, when you pull them in with your legs, you often end up wrapping their head with an arm, so a grip that flows off that would make sense. That might tie the lesson together more logically. I'm going to do some drilling again with Chris tomorrow anyway, so will have a think. That could also fit nicely with butterfly sweeps, something I'll probably be covering during the open guard month soon.